The more merchandising the merrier. 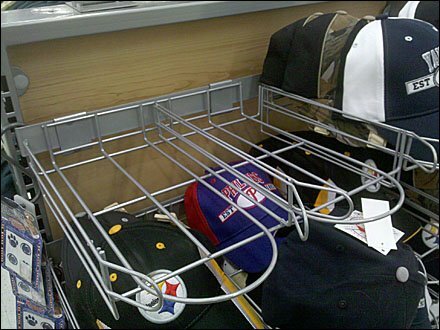 This Twin-Lane Bar-Mount Hat Merchandiser saddle mounts to a Flat Crossbar at the rear. Diagonal divider corners help retain the items. Open Wire allows dust and dirt to fall through, and light to penetrate the offerings See the Twin-Lane Bar-Mount Hat Merchandiser thumbnail for a closeup look. 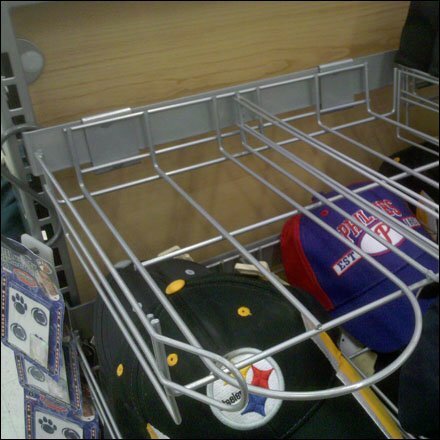 Scroll down to follow cap and hat fixturing here on FixturesCloseUp.